Computers and Structures, Inc. (CSI), leader in software tools for structural and earthquake engineering, has released ETABS 2016 version 16.2.0. New enhancements have been implemented for ETABS 2016, which include added codes for creep, shrinkage and stiffness aging along with effect of rebar now included in creep and shrinkage and modal dampening options. 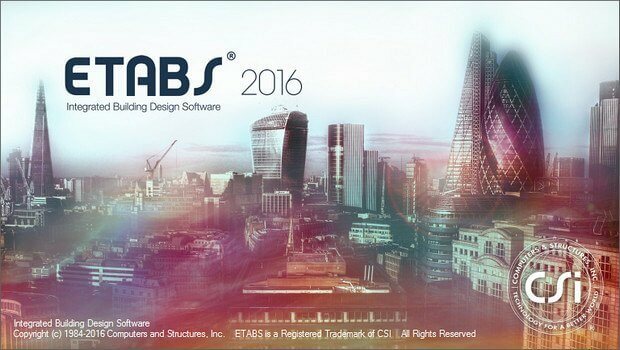 The innovative and revolutionary new ETABS is the ultimate integrated software package for the structural analysis and design of buildings. Incorporating 40 years of continuous research and development, this latest ETABS offers unmatched 3D object based modeling and visualization tools, blazingly fast linear and nonlinear analytical power, sophisticated and comprehensive design capabilities for a wide-range of materials, and insightful graphic displays, reports, and schematic drawings that allow users to quickly and easily decipher and understand analysis and design results. Added codes for creep, shrinkage, and stiffness aging: Eurocode 2-2004, Australian Standard 3600-2009, New Zealand Standard 3101-2006 and GL 2000 models. Creep and shrinkage behavior now includes the effect of rebar to reduce axial shortening of columns and walls. Modal damping option for linear and nonlinear direct-integration time-history analysis, providing more realistic and conservative results. Slab cracked-width display based on Eurocode 2-2004. يستخدم لتصميم المنشآت المختلفة حيث يتم إدخال المسقط الأفقي للطابق المراد تصميمه في البرنامج، وعن طريق عدة أوامر يتم البرنامج بحله والمراد بحله هنا هو أن يخبرنا البرنامج هل الأبعاد وكميات الحديد المدخلة في الحسابات كافية أم تحتاج للزيادة.